Down a road appropriately called Mission on the Fond du Lac Reservation of the Lake Superior band of Chippewa, the Sawyer Log Church sits on a grassy knoll at the edge of a northern Minnesota hardwood forest. Built in 1884 by Chippewa parishioners, it is the second oldest church structure in the Diocese of Duluth, Minnesota and one of the few remaining historic buildings in Carlton County not destroyed in the widespread fires of 1918. Often called The Sawyer Log Church, it has also been referred to as The Church in the Woods and The Guardian Angel Mission Church and it is a designated national historical site. Fond du Lac Community. Missionaries, including Father Frederick Baraga from Sault Ste. Marie, Michigan who visited the Fond du Lac community in 1835, had serviced the area. However, until the log church was constructed half a century later, services were held in local homes. The Sawyer Log Church signifies a mix of Native American initiative and Catholic mission effort. The building is an important marker in the history of Catholicism among the Native Americans of Northern Minnesota. Also, the church is a notable landmark in the broad history of Catholic mission activity in the Great Lakes and the St. Lawrence Valley. In 1938-1939, a shrine to Kateri Tekakwitha was erected in front of the Log Church and for years it was maintained by the Native American and Catholic communities in Sawyer. Kateri was a young Native American woman born in 1656 in upstate New York to an Algonquin mother and a Mohawk chief. She was left an orphan at four when her immediate family died of small pox. Kateri survived the epidemic but was left with considerable scars on her face from the disease. She went to live with an uncle’s family who opposed her conversion to Christianity. She secretly began instructions in the Catholic faith when she was 18 but was not baptized until two years later when her Uncle finally agreed to let her convert. She was often ridiculed for her Christian beliefs, subjected to unfair accusations and had her life threatened. 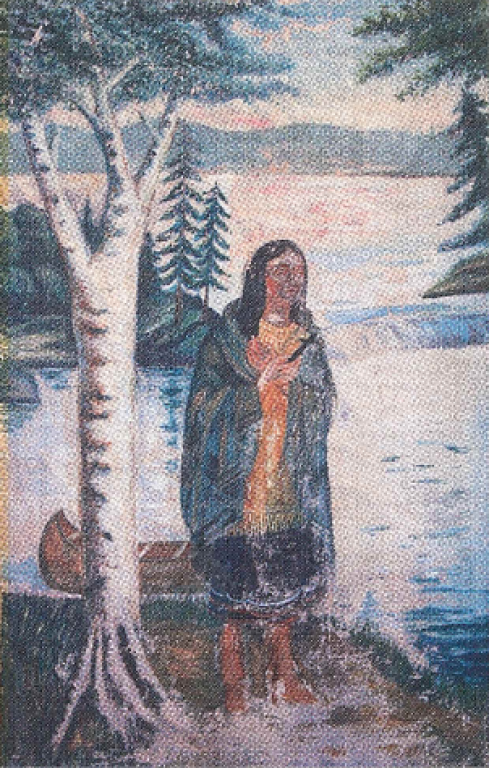 In 1678 she was able to escape her village and joined the Mission of St. Francis Xavier, a settlement of Christian Native Americans in Canada. She made her first communion there in 1679 and made a vow of perpetual virginity, offering herself to the Blessed Mother Mary to accept her as a daughter. She died from a serious illness on April 17th, 1680 and is buried in Canada. It has been said that at the time of her death the small pox scars on her face began to fade and eventually disappeared leaving her radiant and beautiful. After her death she was credited with many healing acts, including curing a Canadian officer and explorer of rheumatism. The explorer was Sir Jean Du Luth. The city of Duluth, Minnesota, about 30 miles northeast of Sawyer, is named for him. Kateri Tekakwitha was canonized on October 21, 2012 by Pope Benedict XVI. She is the first Native American woman to reach sainthood. Over the years, the Shrine and the Log Church have fallen into disrepair. The parish grew too large for the small structure and funds were raised to build a new church, Saints Mary and Joseph, next door to The Log Church. The land where both churches sit is deeded to the Diocese of Duluth but is on the Fond du Lac reservation. The new church, dedicated in 1969, houses the centerpiece from the altar of The Log Church with a statue of Saint Kateri, blessed by the current Bishop of Duluth, Paul Sirba. A canvas painting of The Lily of the Mohawk, done in the 1930s by Father Henry Yzermans, O.S.C. also hangs in the new church. After St. Kateri’s canonization, a present member of Saints Mary and Joseph Parish rebuilt the Shrine to her and placed it in front of The Log Church. This has sparked renewed interest in renovating this important historical landmark. The Saints Mary and Joseph Parish, as well as the Diocese of Duluth and Native American Catholics are working together to restore this integral part of Minnesota, Native American, and Catholic missionary history and culture.